The Deluxe Media LapDesk™ is not only a multipurpose work surface measuring 16" x 12.75 " x 1.75" which is enough room for a 15" laptop but also holds your tablet, eReader, or smart phone in the convenient media slot. The ergonomic wrist pad provides comfort and support while typing and the tapered design of the cushioned lap surface provides stability. The silver carbon15 surface is sleek and modern, and will even impress the most discriminating "techie". 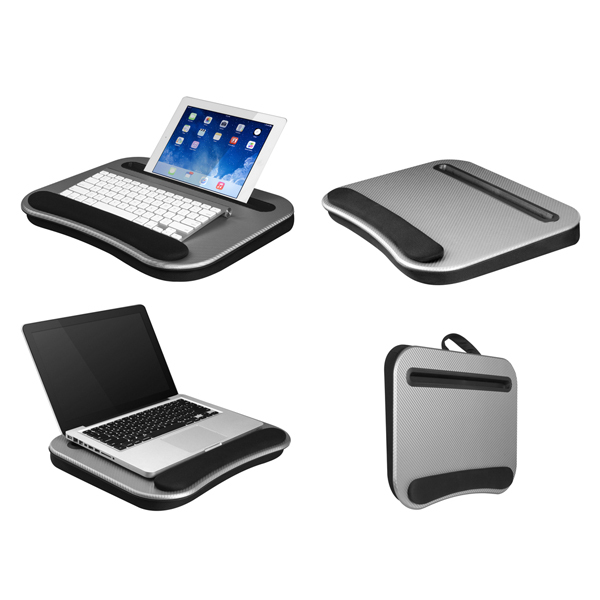 This Deluxe Media LapDesk™ is portable because it is lightweight and has a convenient carrying handle so you can always stay connected and use your LapDesk™ on the go; whether at home, in the car, or in a plane. No matter where you are you can always get work done in style and comfort!